You remember how it was in the past, before the election of Lula, when hunger seemed a natural and inevitable phenomenon, against which nothing could be done? When millions of children slept and woke up with nothing to eat? Well, the "impossible" happened in just ten years. With Lula and Dilma, Brazil is no longer on the global hunger map, for the first time in its history. According to the report "The State of Food Insecurity in the World – 2014," published last September 16 by the United Nations Food and Agriculture Organization (FAO), Brazil reduced the population in a situation of malnutrition between 2002 and 2012 by 82%. The report shows that the Prevalence of Malnutrition indicator, as used by FAO for 50 years to measure and track hunger internationally, Brazil achieved an historical milestone, of 1.7% - when the indicator drops to under 5%, the organization considers that a country has overcome the problem of hunger. Among the policies that have made Brazil an example to be followed by other countries in the world the FAO emphasizes generating 21 million jobs and real growth of the minimum wage by 71.5% (read more in Jobs and Wages), higher food production (read more Family Agriculture & Agrarian Reform), school meals delivered daily to 43 million children and youths, equivalent to a population of Argentina fed every day (read more in Education) and, of course, the world’s largest income transfer program: Bolsa Família. Thanks to Lula and Dilma, Brazil is undergoing a process of inclusion unprecedented in history. 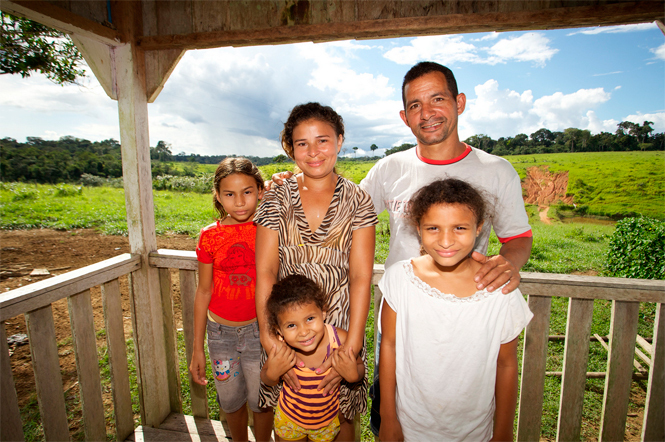 With the Bolsa Família, 36 million Brazilians have emerged from extreme poverty. Brazil today is a more developed and less unequal country, very different than the Brazil of 12 years ago, when millions of Brazilians did not have enough to eat and poor children were obliged to leave school to help feed their families. Without an education, these children grew up poor and had children who also poor and condemned to growing up without a future. Hunger was inherited: extreme poverty was passed on from generation to generation. At the beginning of his administration, Lula reaffirmed that every Brazilian had the right to a minimum of three meals per day and set up the largest income transfer program in the world that today expanded and deepened by the government of President Dilma - provides benefit to 14 million families (50 million people). The Bolsa Família promotes both inclusion and citizenship, generates employment, benefits the economy, increases the level of education, reduces infant mortality and health to create a country that is richer and without poverty, a country for everyone. Forget the “Indolence Effect” so often mentioned by biased analysts. It does not exist and never did. No less than 75% of the adult beneficiaries are in the workforce. In addition, 1.7 million families voluntarily left the program and another million did not reregister with the program (probably because they managed to improve their lives). The truth is that no beneficiary lives a life of ease: each family receives, on average, R $167.00 per month - not much but enough to provide food security and to guarantee - or rather, require - regular health checkups and school attendance. And by raising the level of education and the quality of health of the population, the Bolsa Família is helping to change not only the lives of the poor, but the future of Brazil. Under Dilma, the income transfer policy begun under Lula went through two signifcant changes in order to accomplish the goal of the eradication of extreme poverty with the incorporation of activities for productive inclusion and access to public services: the “Brasil Sem Miséria” (Brazil Without Poverty) and the Brasil Carinhoso (“Brazil Caring”) programs. •In 2011, President Dilma introduced the Brazil Without Poverty Program whose objective is explicit in its title. With the Brazil without poverty program, the Bolsa Família received additional resources to be used for the poorest of the poor: the lower the per capita income of the family, the greater is the amount they receive, guaranteeing that each member of the family will have an income of at least R $77 (US$35) per month. This program provided benefits to 22 million Brazilians that were still living in extreme poverty. Benefits enjoyed a real average increase of 44%; for the poorest of the poor, the interest was 84%. In addition to the transfer of income, the beneficiaries were provided access to various policies for productive inclusion. In just a single decade, with the Bolsa Família and the Brasil Sem Miséria programs extreme poverty in Brazil declined by 89%. It was the end of extreme poverty from an income point of view, the first step toward a life with greater dignity. One of the cruelest faces of poverty: 42% of the Brazilians that live under conditions of extreme poverty are less than 15 years of age. To meet the needs of the most vulnerable portion of this group - children six years of age or less – the Dilma administration established the Brazil Cares Program (“Brasil Carinhoso”). Nearly 600,000 child beneficiaries attend child care centers everyday. The distribution of vitamin A and iron sulfate free of charge protects against illnesses that are harmful to child development. The funding distributed for school lunch programs for children enrolled in the public school system was increased by 66%. Everything that Brazilian girls and boys need to grow up healthy, to develop their potential strengths and become full citizens. 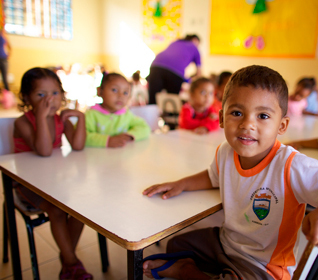 Learn more about Brasil Cares here. 39% of the Brazilians who emerge from extreme poverty over the last decade were less than 14 years old. With the Bolsa Família and the Brasil sem Miséria programs, the percentage of children and adolescents living in conditions of extreme poverty declined from 10.5% in 2003 to 0.3% in 2013. "The Bolsa Família is the largest and most efficient income transfer program in the world. It serves both to diminish poverty as well as stimulate the economy and consumption among lower income groups. It is an instrument to combat hunger, and at the same time promote education and health. Is not an expense, it is rather an investment in the quality of life of our people ". "We know that the Bolsa Família was never intended to be the end of the journey, but rather a bridge, it was never intended to be the top of the ladder but rather the first step. It was intended, as President Lula has already said, as a way out of poverty and the door into a world with a future and hope"
"My life was very different before the Bolsa Família. My children went to school and had to share a notebook, because I could not afford to buy more than one. Today, we have moved out of our wooden shack and live in a house with masonry and brick walls, and they are all grown and raised and educated and have a much better standard of living. I think it is important to show to everyone that the Bolsa Família changes people's lives". Many people criticize the Bolsa Família, but very few of them know the reality of life in the Northeast of Brazil. With the Bolsa Família, low-income families are able to buy feed for the animals, seeds to plant, fertilizers and other agricultural inputs to feed the family. This, for example, in the city of Inajá-PE, encouraged people to open more stores, today there are more than 20, the now unemployed an average of more than 100 people". Manoel: "oung man, I get really upset when I hear people say that people who get the Bolsa Família don't want to work. Tell him to come up year to Neópolis. Since the Bolsa Família arrived, the town has flourished, the women have begun to work in handicrafts and lace for sale over in Penedo (Alagoas). And we have begun to produce to supply the bed-and-breakfasts. That started about 10 years ago, right Lina?" Evangelina: "That's right. Now there are lots of people do not need the Bolsa Família anymore. You think that once we begin to eat properly that we want to go back to dry flour and water? Heaven forbid!" "With the money from the Bolsa Família, added to what we already earned, my husband and I managed to build our house. I think that the requirement that they make for the Bolsa, to keep the children in school and properly vaccinated, is as important as the house, because in addition to having a place to live people now have their health. ".